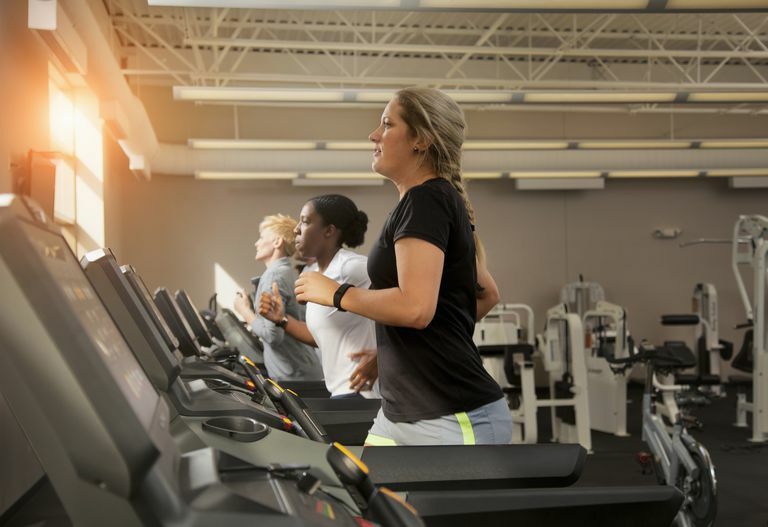 If you're new to exercise, you've probably heard about interval training, a method of training that has you pushing out of your comfort zone for a certain period of time and then recovering. What's great about interval training is that there are a variety of ways to do it. More advanced exercisers can work at a very high intensity, getting into the anaerobic energy zone where oxygen is at a premium. The reason interval training is so popular is because working at higher levels of intensity helps you build endurance more quickly and it helps you burn more calories, which is great for weight loss. Not only that, but it makes your workout more interesting. Instead of going at the same pace for the entire workout, you mix things up which can make the workout seem shorter than it really is. You may wonder if you can do interval training if you're not a veteran exerciser and the answer is yes. Beginners can get a lot out of interval training. Not only can you switch up your workouts, making them a little more fun, you give your body a chance to get used to working just a little harder. The upshot is, you only work hard for a very short period of time, making it a more comfortable workout. That's much better than slogging through a long workout or, on the other hand, trying to work at a high intensity for the length of your workout. The following workout is a great place to start if you're a beginner. It's 21 minutes long and includes work intervals that have you getting pushing just a bit out of your comfort zone. That means you won't be breathless or miserable, but simply pushing yourself just a bit, the perfect way to build a strong cardio foundation for getting healthy and losing weight. The workout is shown using a treadmill with changes in speed and incline, but you can use any machine of your choice or take the workout outside. The elliptical trainer or stationary bicycle are good choices as well, but you can also do a brisk walk, jog or cycle outside. Just use the work intervals to increase your speed, incline and/or resistance depending on what type of activity you're doing. Work sets: For each 'work set', use the settings on your machine (incline, speed, resistance, ramps, etc.) to increase intensity. Outside, increase speed or find a hill. You should be working out of your comfort zone, but not so hard that you feel dizzy or lightheaded. It's just a little uncomfortable. Recovery sets: For each 'rest set', lower those same settings, or slow down/go downhill for outdoor exercise until you're back to a moderate pace. You should be completely recovered before the next work set. Modify the speed and intensity according to your fitness level: If you aren't ready for the higher intensity, it's smart to go at the intensity you are comfortable with. Similarly, if this doesn't seem to be enough for you, feel free to speed up or increase the incline or resistance. Monitor your intensity: The rate of perceived exertion levels (RPE) are there to help you keep track of your intensity on a scale of 1 to 10 on this perceived exertion chart. During rest sets, stay around 4 to 5 RPE. During work sets, stay around 5 to 6 RPE. There isn't a huge difference between the work and rest sets, you simply want to work a little harder during the work sets. See your doctor if you have any injuries or conditions. You can also use a target heart rate calculator and/or the talk test to monitor your exercise intensity. Once you are ready to progress, you can simply add another work set/rest set pair. If you want to keep going, add another set each workout or just one workout a week. Try this kind of interval training with other activities to switch things up, improve your endurance and help you burn more calories. This steady increase in the duration of your workout will allow you get into better shape gradually without working so hard that you start to avoid working out.